D.F. Chase was awarded the task of performing an interior/ exterior renovation of the existing Andrew’s Cadillac dealership, which was required by GM to bring the facility up to the vehicle manufacturer’s current standards. The interior renovation includes a complete new light fixture package, all new finishes and modifications to the existing spaces to make the space work more efficiently for the owner. D.F. Chase removed the existing showroom entry and built a new customer entry which creates a main “focal point” for customers to be directed into the newly renovated showroom. Added on the opposite side of the showroom is a new car delivery canopy, an area designated specifically for owners picking up their new vehicle. 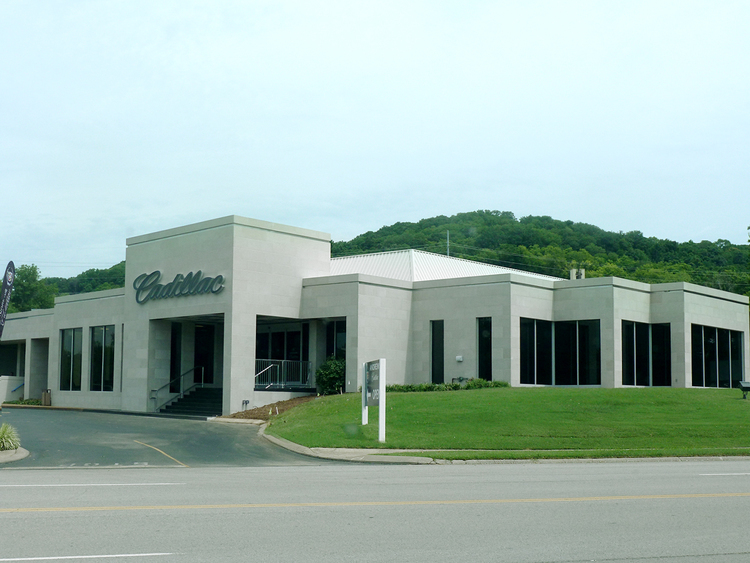 The entire exterior of the dealership is cladded with a specialized limestone panel system for a rich, elegant and updated look creating visual stimulation for the dealership. All work was completed without any interruption of daily dealership operations, allowing the client to stay focused on the task at hand, selling cars.